The required conflict minerals disclosure must appear in a specialized disclosure report filed with the SEC on Form SD, which is due annually by May 31 for the prior calendar year. This bulletin summarizes the steps that SEC-reporting companies should be taking to prepare their first Form SD. 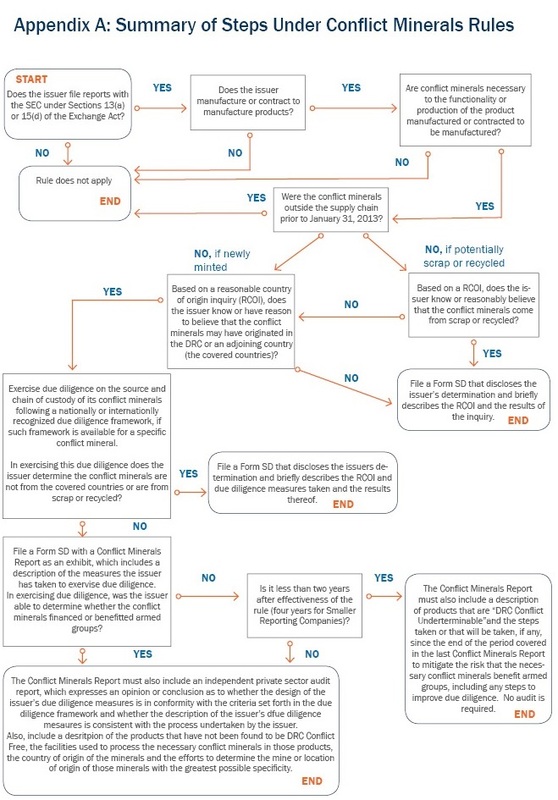 The SEC’s flow chart showing these steps is reproduced in Appendix A. Companies do not have to comply with the new rules in respect of conflict minerals that were outside the supply chain (i.e., the minerals were already smelted or fully refined or were already outside the DRC or an adjoining country) before January 31, 2013.
then the company must file a Form SD disclosing its findings and briefly describing the country-of-origin inquiry that was undertaken. This information must also be posted on the company’s website. If a company cannot make either of the determinations above, then it must proceed to step 3.
then the company’s products may be categorized as DRC conflict-free. In that case, the company’s Form SD must disclose this determination and briefly describe the country of origin inquiry and due diligence measures that were undertaken. The Form SD information must also be disclosed on the company’s website. the company’s disclosure is accurate in describing the due diligence measures that were undertaken on the source and chain of custody of the conflict minerals. the company’s efforts to determine the mine or location of origin of the conflict minerals with the greatest possible specificity. the company must disclose the steps that have been or will be taken, if any, to mitigate the risk that its conflict minerals benefit armed groups, including any steps to improve the company’s due diligence. Beginning in 2015,8 companies may no longer categorize any products as DRC conflict-undeterminable and all of the regular rules must be complied with, including the independent audit requirement. 1 Mining companies are not treated as manufacturers, so they are not subject the new rules by virtue of their mining activities. 2 An adjoining country is one that shares an internationally recognized border with the DRC, which presently incudes Angola, Burundi, Central African Republic, the Republic of the Congo, Rwanda, South Sudan, Tanzania, Uganda and Zambia. 3 Conflict minerals are considered to be from recycled or scrap sources if they are from recycled metals, which are reclaimed end-user or post-consumer products, or scrap processed metals created during product manufacturing. Recycled metal includes excess, obsolete, defective and scrap metal materials that contain refined or processed metals that are appropriate to recycle in the production of tin, tantalum, tungsten or gold. Minerals partially processed, unprocessed, or a by-product from another ore are not considered recycled. 4 A nationally or internationally recognized due diligence framework means one that was established following due-process procedures, including the broad distribution of the framework for public comment, and is consistent with the criteria standards in the Government Auditing Standards established by the Comptroller General of the United States. 5 This framework is available at http://www.oecd.org/corporate/mne/mining.htm. 6 An armed group means one that is identified as a perpetrator of serious human rights abuses in annual Country Reports on Human Rights Practices under sections 116(d) and 502B(b) of the Foreign Assistance Act of 1961 relating to the DRC or an adjoining country. 7 For smaller reporting companies, which generally means those with a worldwide public float of less than US$75 million, these modified rules apply from 2014 to 2016 inclusive. 8 2017 for smaller reporting companies.